the median reflects how much the person at the 50th percentile of the income distribution earns (or spends), giving us a better picture of the well-being of a “typical” individual in a given country. Take Nigeria and Tanzania: in 2010, Nigeria’s GDP per capita (at PPP) was $5,123; Tanzania’s stood at only $2,111. This suggests that Nigerians were more than twice as well off as Tanzanians. Yet, if we compare consumption medians, a different picture emerges: a Nigerian at the middle of the income distribution lived on $1.80 a day, while his or her Tanzanian counterpart had 20 cents more to spend, at $2 a day. I got curious and made maps of median (2011 $$) and per capita (2010 $$) incomes on the Continent. What is going on with median incomes in Central Africa from CAR through to Mozambique? Also, what’s up with Zambia? When it comes to aid and development, the question we should be asking is not whether aid works (a.k.a the Great Easterly-Sachs Debate), but rather what kind of aid works and under what conditions. Part of the problem is the polarised and non-nuanced public policy debate between the ‘aid works’ versus ‘aid is a waste of money’ camps. In our review we are constrained by reviewing how the literature has approached this question. We thus take aid ‘working’ or ‘effective aid’ to mean aid that contributes to, or is associated with, even if only modestly, positive development outcomes such as economic growth and social development. This is not an ideal definition but it is common in the literature and thus a review is constrained in opening this question further. Meanwhile the lack of a counter-factual is the biggest barrier to ever knowing for certain the impact of aid. The idea that aid ‘works’ can be questioned by interested parties, both informed and uninformed; assertions that aid is wholly or in part responsible for impressive improvements in human development in the past couple of decades are questionable. It is also not difficult to find examples where aid has been detrimental to countries and communities and where there may be trade-offs in terms of positive and negative impacts. More modesty is needed in any claims for how aid can contribute to development. However, the evidence, which we discuss in this paper, does suggest that aid has contributed in many countries and, despite its many flaws, can continue to do so. Read the whole paper here (highly recommended). Research shows that the combination of urban sprawl and a lack of adequate public transportation is disastrous for low-income urbanites. Aware of this fact, the political leadership of Springfield resolved that they would do everything in their power to avoid becoming the next Atlanta. But to do so they have had to overcome challenges such poor demand (on account of a tiny car-loving population of just over 30,000), endemic corruption, and the lack of political will (The last time the town tried to build a subway system the contractor did a rather shoddy job, forcing the town to abandon the project altogether). 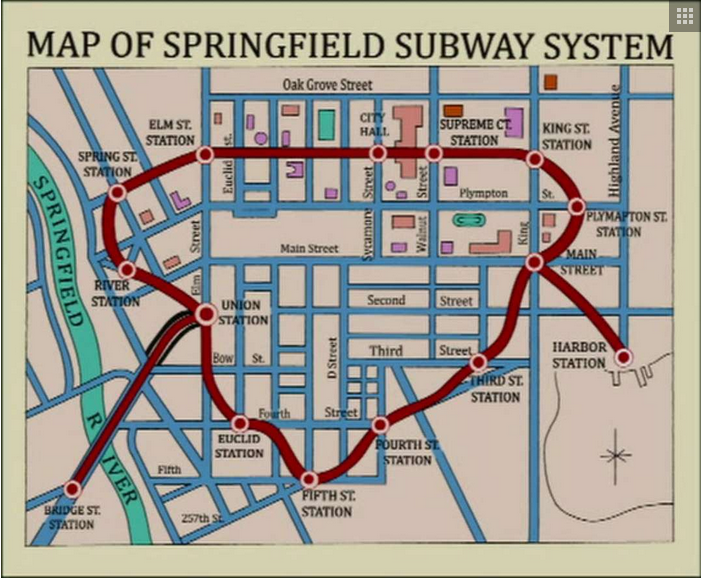 This is not the first transportation overhaul that the STA (Springfield Transit Authority) has implemented, although the last drastic change was way back in a 1993 episode with the introduction of a failed monorail system. Since then, it’s been pretty much all cars and skateboards on the city’s streets, and viewers learned that the single sad loop of a subway system in the city was actually abandoned. Poor transportation construction seems to be endemic to Springfield, as the tunnels, although functional, were apparently ruining the underground foundations of buildings. The system appears much more lively, covering spunky new districts like Jerk Circle, Boulevard of Broken Dreams, and Little Pwagmattasquarmsettport (last stop on the indigo line). 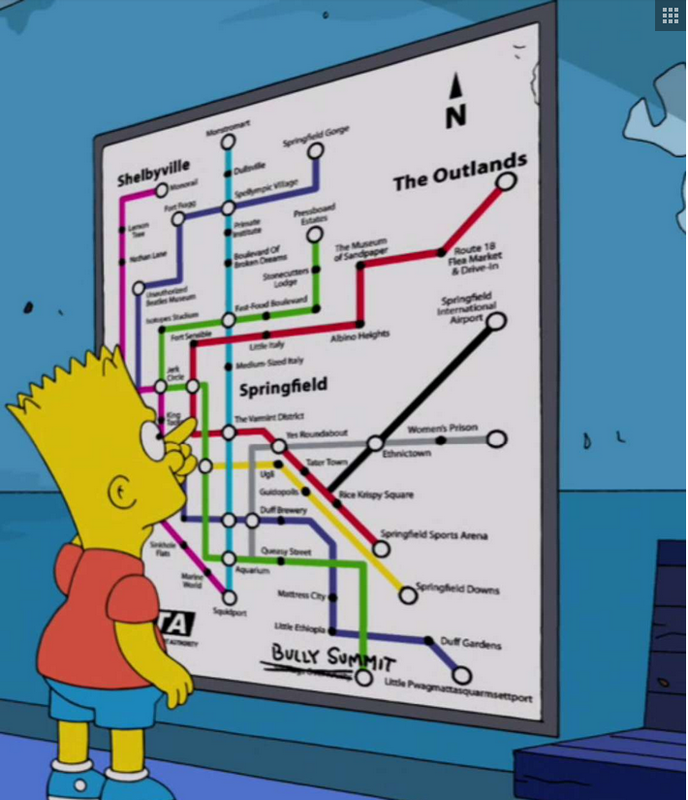 …….Bart probably won’t be putting his skateboard away any time soon, but it will be interesting to see how these fictional sites of comedy and intrigue return in the series. Will Springfield face a familiar future of urban disputes—perhaps sparked by the aesthetic retaliation from the residents of the Ugli district, or maybe the gentrification of Ethnictown? However, there are still lingering questions about future commercial viability of the new expensive subway system, especially if the town fails to attract new residents. It doesn’t help that the town has a history of being hostile to immigrants. But given their apparent appreciation for evidence-based rigorous academic research in the process of public policy development, perhaps they could benefit from some of the fantastic work on immigration and migration coming out of the CGD. In addition, it is unclear how the town financed the new subway system. As the Economist reports, banks have lately been wary of financing infrastructure investments. And with Yellen and co. scheduled to hit the brakes soon and a sooner-than-expected rates hike, Springfield’s public debt could become unsustainable.